Banffshire & Buchan Coast MSP Stewart Stevenson has highlighted the need for training for new drivers to be reviewed during a debate in parliament about Graduated Driving Licences. 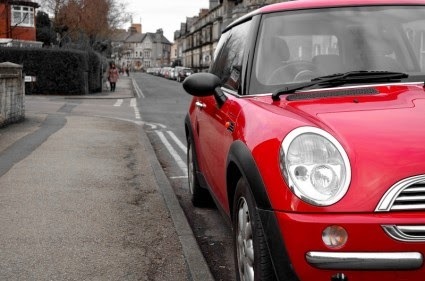 “This debate is the latest stage in a long process in which the Scottish Government has listened, gathered evidence and advocated an approach to road safety for young, inexperienced drivers that includes some form of graduated driver licensing. Crucially, that process includes debate with young people. “The Transport Research Laboratory, which works with over 100 countries, suggests that there could be quite a wide range of savings in terms of lives saved and casualty reduction from graduated driver licensing. It suggests 100 hours of supervised learning over 12 months. Stewart Stevenson, MSP for Banffshire & Buchan Coast, and Angus Robertson, MP for Moray, have met with concerned parents and community representatives with regards to Moray Council’s School Estate Review. The parliamentarians heard about worries in relation to the proposals for Portknockie, Findochty, Portessie and Cullen Primary Schools. Moray Council has commissioned Caledonian Economics to undertake a school estate review and parents have fears with regards to a proposal put forward that could see the four schools merging. The meeting allowed parents the opportunity to express their views and hear from the parliamentarians how best to take their concerns forward. “The four communities clearly have got a very committed group of parents who are not only concerned as to the impact on their children but also the impact on the communities where they live. Clearly, if these schools are removed it would make these communities less attractive places in which to live and potentially impact on facilities, such as shops and transport. “People are very alert to the wider implications of Moray Council’s proposals and are also very clear that small schools are where the best education is provided, particularly for those children with additional needs. “Stewart Stevenson and I are impressed by the commitment to the best education standards currently offered by each of these schools to their local communities. “We have yet to see the educational advantages which are supposedly at the heart of the alternative plans. “In recent years, too many decisions in Elgin have been detrimental to coastal communities. “It was quite a helpful and open meeting and both Mr Stevenson and Mr Robertson were able to give us lots of insights, especially in how to make it more difficult to make decisions on merger and closure. “We now have many options to look at and have also identified more things which are missing from the consultants’ report. It looks like it could actually cost more to the taxpayer in the long run to close or merge these schools than to run them. Local MSP Stewart Stevenson has welcomed the announcement today (Thursday) that £250,000 has been granted to the former Caley Fisheries warehouse in Peterhead by Historic Scotland. Plans for the B-listed derelict building include its conversion into a mixture of social housing and commercial use. Scottish Government agency Historic Scotland has pledged £1.9m towards renovating six crumbling landmarks across the country, as part of its Building Repair Grant scheme. In a debate in the Scottish Parliament to mark Down’s Syndrome Awareness Week, Stewart Stevenson, SNP MSP for Banffshire & Buchan Coast, praised the developments that have created a greater knowledge of the condition. “It is worth looking at the range of achievements of many with Down’s Syndrome, which is probably nearly as great as it is for people without. Many people with Down’s Syndrome achieve at higher levels than many who have no measurable impairment of any kind, which is to be welcomed. Mr Stevenson added that children with Down’s Syndrome are now living into their 60s and that if they are diagnosed and supported from a young age, they can live independent lives. “There are issues that we still need to take note of. Statistics suggest that 18 health conditions need to be monitored carefully throughout the life of a person with Down’s Syndrome. Banffshire & Buchan Coast MSP Stewart Stevenson has welcomed the Scottish Government’s announcement that seatbelts will be provided on all dedicated school transport across Scotland. “I very much welcome this development which will mean that Scotland’s children are safer when travelling to and from school. Everything practical should be done to ensure that our youngsters are protected, and in the event of an accident, we must make sure that measures have been taken to minimise risk. “The Scottish Government has duties in respect of road safety to children and parents, and I am delighted that approval has been given ‘in principle’ by the UK Government to transfer powers relating to school bus safety. “I am pleased to announce the Scottish Government’s intention to legislate to ensure that seatbelts are provided for children to use whilst travelling to and from school on dedicated school transport. “We have made this announcement to give local authorities and bus operators time to prepare for the change and I look forward to further discussions with CoSLA next month to review the full detail of these plans and consider the financial implications. Seatbelts on school transport will be introduced in a phased roll out, so that local authorities and bus operators have time to adapt to the change. Parliamentarians in Moray have welcomed news that the MORL and BOWL Moray Firth windfarm developments have been consented. 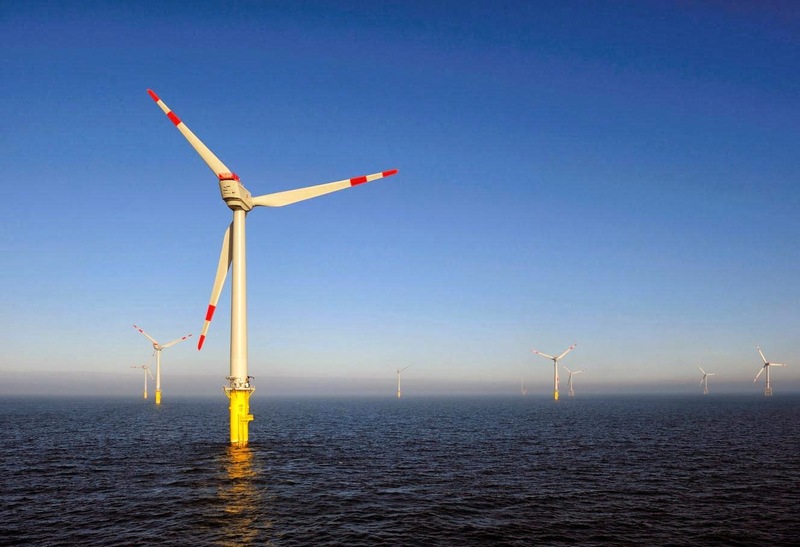 The combined developments are valued £2.5 billion pounds of investment and are expected to generate thousands of construction jobs with several hundred long-term jobs in operations and maintenance of the 326 turbines. There are significant opportunities for Moray through development of Buckie Harbour as an Operations and Maintenance Base and for supply chain work for existing Moray businesses, as well as generating more inward investment. “The renewables revolution in Scotland is absolutely massive for Moray. With hundreds of offshore turbines and Buckie being a reliable all weather port it is easy to see where the benefits for economic development in the region can come from. “Development of Buckie Harbour is recognised as being of national infrastructure importance and the windfarm developments in the Moray Firth are a major factor in making that viable and delivering substantial economic development to Buckie and the wider Moray economy. “A lot of behind the scenes work has been done to get these projects to this point and the consents for them are a huge milestone. The highly skilled workforce that will now be required to bring these projects to fruition will bring people to live and work in Moray and provide a major boost to the whole regional economy. 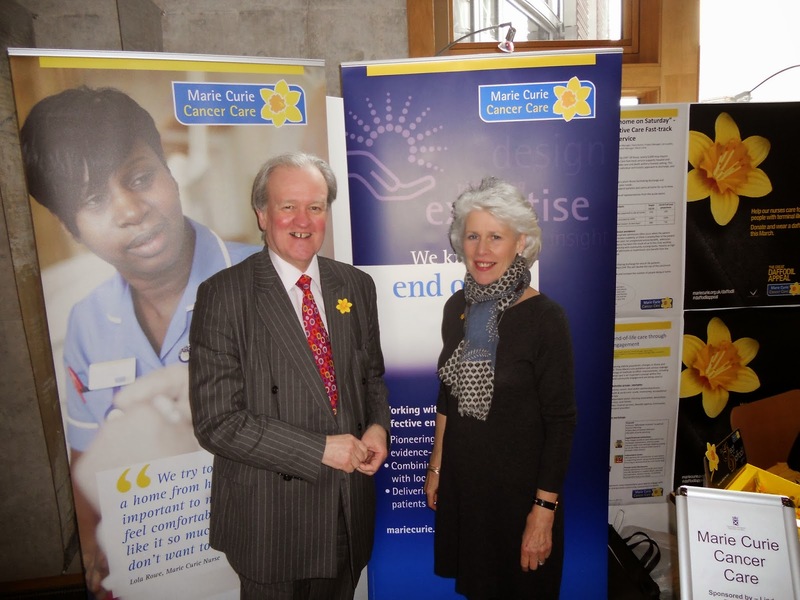 Stewart Stevenson SNP MSP for Banffshire & Buchan Coast, lent his support to Marie Curie Cancer Care’s Great Daffodil Appeal at the Scottish Parliament today. Wearing his daffodil with pride, Mr Stevenson met staff and heard about the work of the charity that cares for terminally ill patients and their families across Scotland. He also handed over a bag of donated clothing to help stock the charity’s shops. The Great Daffodil Appeal is Marie Curie’s biggest fundraiser, which encourages everyone to give a donation and wear a daffodil pin in March. The money raised will help Marie Curie nurses to provide more free care to local people with terminal illnesses in their own homes and in the two Scottish Marie Curie Hospices in Edinburgh and Glasgow. “The work carried out by Marie Curie nurses is exceptional, and the Great Daffodil Appeal is vital to generate the funds needed to carry out the work that they do. “It’s thanks to the support of MSPs such as Stewart Stevenson that we can spread the word about the Great Daffodil Appeal and raise vital funds to support terminally ill people in Scotland. To find out more about the Great Daffodil Appeal go to www.mariecurie.org.uk/daffodil or call 0845 601 3107. Contractors across the North-east that want to become part of Scottish Water’s procurement framework should go to a Market Day Conference being held by the company on March 17. This was the message from Stewart Stevenson SNP MSP for Banffshire & Buchan Coast who wants local businesses to take every opportunity they can to benefit from procurement opportunities. The conference will outline Scottish Water's procurement process for rural contractors who can help deliver investment in the upcoming 2015-21 investment period. The target audience is contractors and specialist suppliers or service providers who can provide rural, in-house delivery capabilities to support the delivery of Scottish Water's Infrastructure and Non-Infrastructure capital programme for 2015-21. The Market Day Conference will be held on Monday, 17 March, from 11.30am to 2.30pm at the Holiday Inn, Westhill, Aberdeen. For more information go to www.scottishwater.co.uk/listening. For the first time since the Independence Referendum campaign began, the latest YouGov poll has found that 40 per cent of people are in favour of a YES vote in the referendum. Stewart Stevenson, SNP MSP for Banffshire & Buchan Coast, highlighted the findings of the poll which showed that after undecided voters were removed, support for the YES campaign has increased by 1 per cent to 40 per cent since YouGov’s last poll, while backing for a NO vote had fallen by the same amount. “This is a very encouraging poll, and confirms the progress being made towards securing a Yes vote in September. “Just as with other recent polls, the direction of travel is firmly in favour of a Yes vote, and this is the sixth poll in a row to put Yes support in the 40s. An uncollected £35 billion in taxes by the UK Government was highlighted by Stewart Stevenson, SNP MSP for Banffshire & Buchan Coast, this week. Mr Stevenson questioned John Swinney, Cabinet Secretary for Finance, Employment and Sustainable Growth, on how the Scottish Government would tackle the problem of tax avoidance. Mr Swinney said the Scottish Government was determined to act decisively on avoidance of devolved taxes, adding that the Revenue Scotland and Tax Powers Bill, currently before Parliament, would enable Scotland to take robust action to counteract the issue. 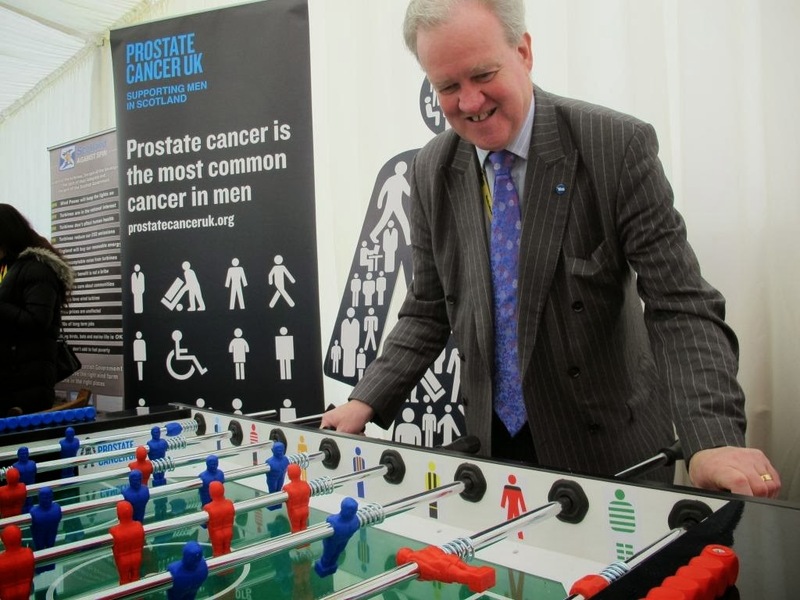 Stewart Stevenson, SNP MSP for Banffshire & Buchan Coast, is backing Prostate Cancer UK’s ‘Men United v Prostate Cancer’ campaign, which uses sport terminology to explain the deadly disease. “Prostate cancer is the most common cancer in men and is predicted to be the most common cancer overall by 2030. “Despite this we know that the quality of care and support men with the condition receive varies throughout Scotland. To address this I reiterate the call on NHS Boards to implement Prostate Cancer UK’s excellent Quality Checklist, and I am delighted to sign for Men United v Prostate Cancer. Scottish football legend Denis Law, chat show host Sir Michael Parkinson and comedy icon Bill Bailey have also joined Mr Stevenson in the campaign. "Prostate cancer survival rates are below the European average, research into the disease lags a decade behind that of other cancers, and quality of care and support varies depending on where you live.